Supernatural Season 14 Episode 10 Recap: "Nihilism"
With a reduced episode count to 20 for season 14, Supernatural needed to pick up steam in its storyline, and “Nihilism” does just that. Characters never stay gone forever from the show, so not only did we get a few returning on this episode, we got a very surprising one. The episode picks up where no one would expect it to – with Pamela Barnes (remember how beautifully Castiel burned her eyes out 10 years ago?) arriving to work in a bar whose bartender happens to be Dean Winchester (Jensen Ackles) of all people. 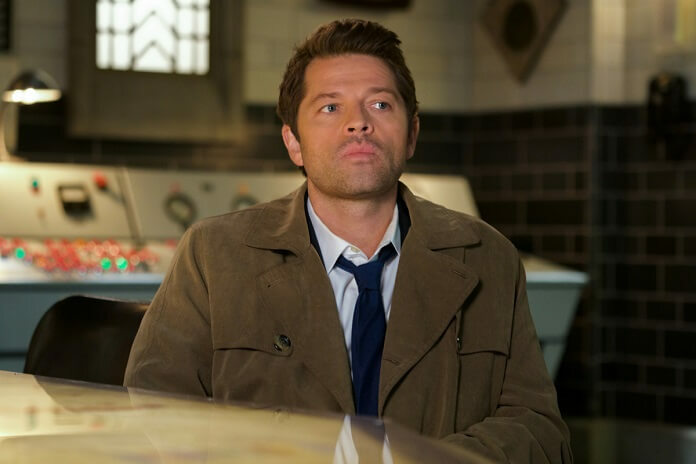 Neither of them comment on how bizarre this situation is, and we’re treated to some exposition over how Cas and Sam are working a case in Wichita, before a real estate agent arrives to try and convince Dean to sell the bar. As it happens, Dean’s living the life and has no interest in selling his fine establishment. However, it seems Dean can never go too far from hunting and he’s attacked by two vampires – one of which had been pretending to be an unconscious customer. What happens next? Dean and Pamela are enjoying a few shots when the entire event refreshes once more, and then again, and then again. Dean keeps living out a massive case of déjà vu in the bar and we’re then taken out to the real world. Turns out no time has passed since the mid-season finale and Michael has Dean locked away in his idyllic dream while he monologues to Cas (Misha Collins), Sam (Jared Padalecki), and Jack (Alexander Calvert) about how he’s going to take over the world. Cas and Sam blindside him (why do Supernatural villains insist on these long monologues?) and handcuff him with angel cuffs. However, with Michael’s monsters banging on the doors, ready to arrive any second, a desperate Sam prays to Jessica the Reaper. Another reaper called Violet shows up – even reapers need shift hours now – and informs him she can only provide emotional support, because that’s real helpful, right? But then, all of a sudden, she receives orders from somewhere and transports everyone, including Michael, back to the bunker – although Jessica claims she wasn’t the one to do it. Once they’ve regained their bearings, Sam decides to infiltrate Dean’s mind the same way Crowley had done when Sam was possessed by Gadreel. The bad news is that, as Maggie informs them, Michael’s monsters are now headed for the bunker. All this while Michael kicks back comfortably as he claims he’ll be the one to rip Sam apart. He even messes with Jack by twisting his access to Dean’s emotions, calling Jack “just a job” to Dean. Meanwhile, Sam finds a Men of Letters contraption (convenient, right?) that will help him and Castiel access Dean’s mind. This is when Michael taunts Cas with the very real possibility that Chuck really doesn’t care about anything that’s going on. According to him, in his world he and his version of Lucifer had figured God would return to sort things out, and he never did despite the world going to hell. Michael says that after seeing who Chuck really is – thanks to Dean’s memories of him – he realizes God is just a writer, and he’s moved on from his “drafts”, which are both Michael’s world and the world he is in now. So now, he’s going to make it his mission to destroy each one of God’s “draft” worlds until Chuck’s the only one left – after that? “Even God can die,” a defiant Michael claims. 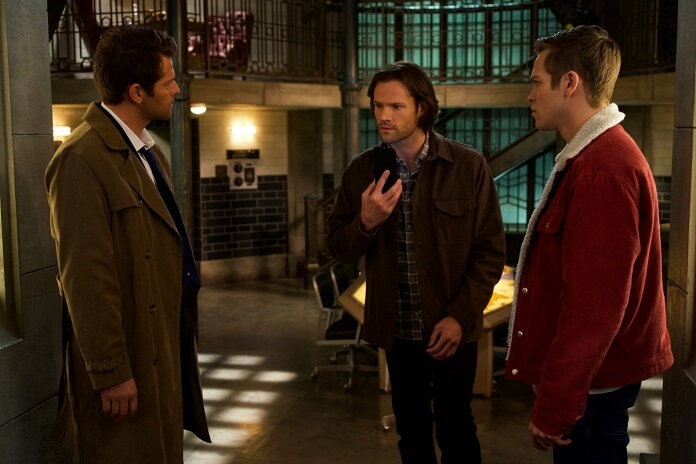 Once Cas and Sam enter Dean’s mind – which at this point resembles the Empty – Cas sifts through Dean’s traumatic experiences where we get a recollection of season 3 Dean’s time in Hell; however, Sam figures Michael would keep Dean content rather than tortured and the two locate Dean in the bar (not before wading through Dean’s “happy” memory of pie). After a few painstaking scenes where Sam and Cas have to endure Dean’s mental projections refresh over and again, they use the fact that Pamela’s supposed to be blind and dead to hark him back to his senses. There’s also a revival of Sam and Dean’s code word: Poughkeepsie. Michael offers a round of applause to out heroes’ efforts, but insists it was all in vain, even mocking Dean’s relationship with Cas and Sam. He claims Dean only keeps Cas around because he “gripped you tight and raised you from Perdition” in a nod to season 4 Castiel. As for Sam, Michael says Dean was happiest when Sam had abandoned him and John because Sam is not family, just a responsibility, and deep-down Dean said yes to Michael because he feels this way. All this was simply Michael stalling for his monsters to arrive at the bunker because inside Dean’s head none of Michael’s angel mojo works. In the real world, the monsters break through the bunker’s door and begin taking down Maggie and the hunters. This causes Jack to summon magic that eats part of his soul to blast them away a la Jack from season 13. Meanwhile, Michael’s lack of angelic powers made hardly any difference as he delivers a curbstomp beating of Sam and Cas. Now that Michael’s locked away, and the monsters all blown apart by Jack, Cas reprimands Jack for using his powers because a soulless Jack wouldn’t be good news – remember Soulless Sam, everyone? Finally, Dean has difficulty keeping Michael locked in his mind when Billie pays him a visit. Evidently, all the books that Dean had seen containing the likely chances of his death are now rewritten with Michael escaping and using Dean to burn the world. Billie hands Dean the only book that is the exceptions; however, far from offering a solution, a distressed Dean asks Billie what he’s supposed to do with this knowledge, only for Billie to leave that decision up to him. With an adrenaline-pumping episode, Supernatural came back the right way by hitting all the notes hard. The ending left us with a hook that we’ll no doubt be waiting to unravel over the coming few episodes. Although Michael continues to be used only sparingly, this time at least we’ve gotten a proper reason for his absence in the next episodes. But with Jack’s soul in question, Michael’s incapacitated state being dubious at best, and the mysteriousness of the book Billie handed Dean, the rest of the season is shaping up to be great.